As a general and cosmetic dentist in a busy private practice who performs numerous procedures each day, I have come to rely on the Anutra system to optimize workflow efficiency by delivering rapid, profound and predictable anesthesia. When Anutra buffering technology first came out, I quickly embraced it due to its efficacy, simplicity and ease of use. How has the Anutra system improved patients’ perception of treatment? My patients expect a comfortable injection, and for years my practice has built our reputation by delivering it — but the added bonus of using Anutra buffering is that pain management is now much more predictable. I achieve full pulpal anesthesia within two to three minutes for lower blocks. How has Anutra made your practice more efficient? The timesaving advantage is remarkable. With Anutra, I can go to work right away. It has changed the way I practice and the way we schedule. Anutra recently introduced 1% lidocaine to the marketplace. This is groundbreaking for the dental community. How have you utilized 1% buffered lidocaine to enhance your practice efficiency and patient experience? The fact that Anutra has made 1% lidocaine more accessible to dentists is terrific. Imagine the benefits of achieving full anesthesia using one-half the amount of lidocaine, particularly in pediatric populations. The Anutra Syringe is a bit of an adjustment for most practitioners. Is it worth the change? If so, why? At first, I disliked the Anutra Syringe. Not because it was bad, but because it was different. But once I got used to it, I fell in love with it. The ability to give multiple doses affords so much flexibility and eliminates waste. Now you could not pry the Anutra Syringe from my hands if you tried. What advice would you give to a practitioner getting started with Anutra? I recommend using it on every patient possible and just committing to change. If you use it here and there, you will never see its full benefit. I did not use Anutra exclusively at first, but once I committed to staying with every patient after injecting and immediately going to work, my experience was transformed — and so was the perception of patients and staff. 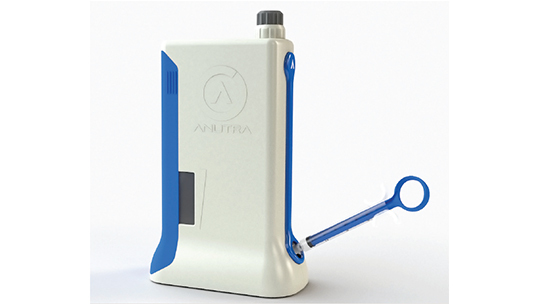 Is the Anutra system expensive? And what is the return on investment? For me, cost is irrelevant. While Anutra may be a dollar or two more per patient, the comfort factor and shorter appointment times are totally worth it. Predictable anesthesia and knowing my patient is going to be numb when I sit down to go to work is a game changer. That is priceless. From Decisions in Dentistry. June 2018;4(6):45.